Cooking, baking and meal prep call for precise measurement. Enter this dynamic duo! Capable of measuring in increments as small as 0.1 ounce, the scale ensures you'll get the accurate measurements your kitchen calls for. The bowl features interior measurement marks to make it even easier. 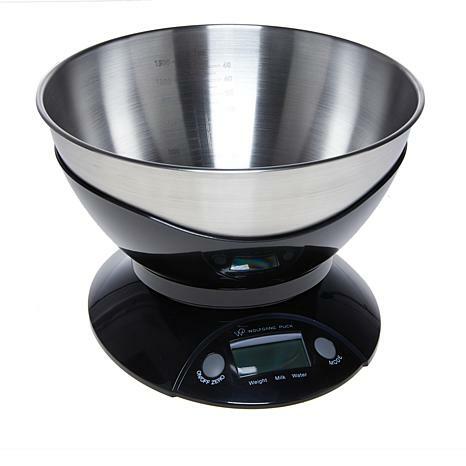 Designed to work in tandem, the scale even has a Precision Tare function that automatically eliminates the weight of the measuring bowl. And with three measuring modes built-into the scale, this pair is sure to measure up. Max. Weight Capacity: 11 lbs. 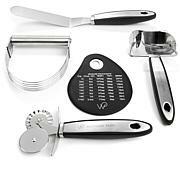 Wolfgang does not disappoint in any of his products. This is something I have needed for so long and he makes his products to last and they are so functional. I am thankful he takes time to make them available to the average person who loves to cook for their families. 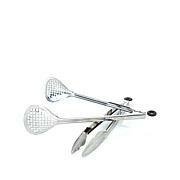 This is so useful in canning fruits and veggies from the garden. Thanks again, Wolfgang. Having taken culinary classes at the local college this is a blessed addition to my tools in the kitchen as in Baking exact measurements are a key to success. This gives you the option to combine ingredients measured in the same bowl with a special reset option. Of the options out on the market, this has proven to be one of the best available. Many thanks to Wolfgang for making it available. 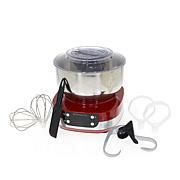 Highly recommended for those who are serious about their baking. At first I almost returned this scale because I mistakenly thought it only measured in ml and gm. I should have read the instructions first, duh. There is a button underneath that switches it to lbs and oz. it is everything I wanted and more. I chose the red to match the rest of my appliances. I can weigh stuff easier with these scales. I needed a small, accurate scale that i could leave on my counter. This one works perfectly 7 it's pretty easy to use. So far, so good!